Usually, any crew member who punches a driver ends up looking for a job afterwards. Not so for the crew members of the #5 and #24 cars who threw punches in the fight that included drivers Brad Keselowski, Jeff Gordon and Kevin Harvick. Hendrick Motorsports has their back. Hendrick Motorsports has the #5 car of Kasey Kahne and the #24 car of Jeff Gordon. Crew members on both of these teams were fined earlier this week along with their crew chiefs, who were held liable for not keeping their subordinates from throwing punches in the fight. Drivers involved in the melee escaped penalty because they couldn't throw a good right hook (or something like that). The punishment handed out was only to those who were caught on camera throwing a punch, which seems a little unfair. Everyone appears to be trying to beat up everybody else in the footage of the melee. Only punishing the guys who had room to get a good punch in and were unlucky enough to have said punch caught on camera seems unfair. Even Hendrick Motorsports thinks that's a bit harsh, and many are speculating that it's in part because everybody hates Keselowski at this point. ESPN went so far as to call Kes "the guy who's easy to hate." Who can blame anyone on Gordon's team for throwing punches at the fellow whose risky move cut the tire of one of their drivers' cars, especially when Keselowski has shown time and time again that he's not out there to make friends? After all, it's the crew who ultimately end up cleaning up the drivers' mess. Okay, so I probably wouldn't resort to punching the guy or anyone on his team (we crapcan folk whine on the forums instead like civilized rednecks), but hey, when everybody starts fighting and it's all-in, I can't really hold being a part of that against this crew, either. So, the team is doing the right thing, standing by the crew members who stood up for Hendrick driver Jeff Gordon in the fight, and will be paying the $185,000 in fines levied against their crew members. "We will, as a team, incur that and won't put that on the crew members," explained Hendrick Motorsports General Manager Doug Duchardt in an interview on SiriusXM. As for the fight itself, Duchardt felt as if it would have never happened had Kevin Harvick never shoved Keselowski from behind. "That whole situation was going to be a discussion and we were getting ready [...] to disperse, and then Kevin pushed Brad in and it all got started," said Duchardt. "I felt like our guys were conducting themselves and everyone was letting Jeff and Brad talk, and then it escalated." 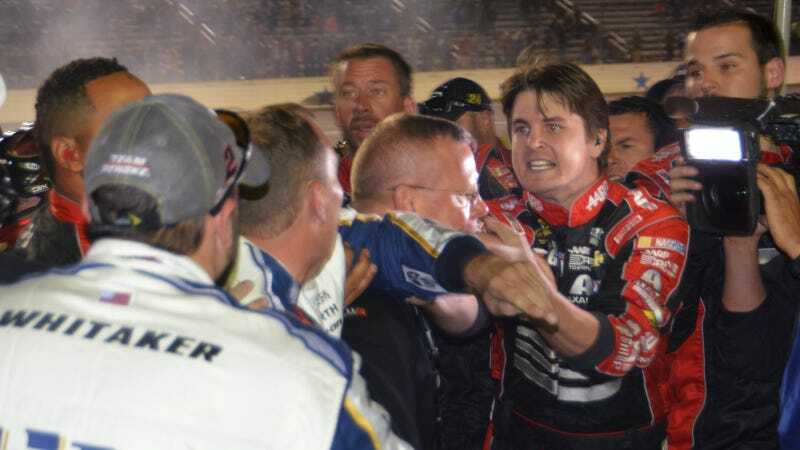 CONCORD, N.C. – Hendrick Motorsports will not appeal penalties announced today by NASCAR related to a post-race incident Sunday evening at Texas Motor Speedway. "With NASCAR's new Chase format, we're seeing an unprecedented level of intensity every single week," said Rick Hendrick, owner of Hendrick Motorsports. "Emotions run high when you're racing for a championship, and that's exciting for our fans and everyone involved with the sport. But there's a line the competitors need to be cognizant of, and we understand that. "Jeff (Gordon) was rightfully fired up Sunday night, and it just reiterated to me how passionate he is and how much he wants to win. The No. 24 team is a group that works together and is loyal to one another. They have our full support as we go into these final two races." Team members involved in the incident will not be additionally sanctioned by Hendrick Motorsports. Fines paid. No additional sanctions. At least that part seems fair.